Let's be real. As a loving owner of a cat or dog, you know that it's not just your prized sofa—but also most of your home decor—that bears the brunt of your beloved pet. Because even when Fluffy isn't trying to destroy your upholstery, the simple act of climbing, sitting, or walking on it can warrant a heavy cleaning bill. For this reason, selecting the best upholstery for your couch can be complicated. Luckily, there are some heavy-duty fabrics that can withstand a few claw marks, prevent clinging pet hair, and resist dirt marks and stains due to the occasional accident. 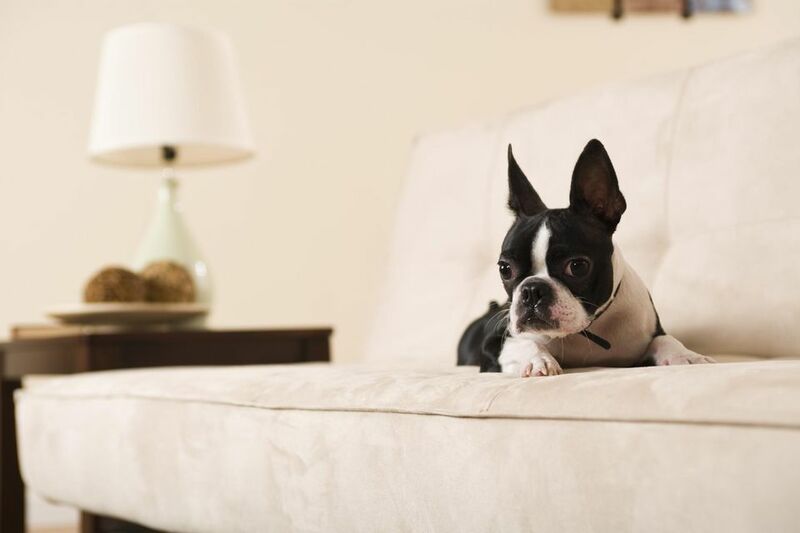 While training your pet to behave (and not to jump up on or scratch the couch) is the best defense against furniture wear, pet-friendly upholstery fabrics can also ease the burden. Select a fabric with a tight weave and one that is free of complicated textures. Steer clear of light colors—even if you have a well-behaved and well-trained pet—and instead choose charcoal grey, brown, or camel-colored couches that hide fur and fit into the color schemes of most rooms. Select a fabric built for heavy usage areas and consider stain-resistant fabric or those meant for indoor and outdoor use, like Sunbrella. Leather is, hands down, one of the best couch coverings for pet owners. In fact, this long-lasting natural material actually improves with age and heavy use. Leather is easy to maintain, comes in many colors, and is available at different price points. But most of all, leather can stand up to pets. Dirt and water can be easily removed and pet hair wipes right off and doesn't cling to the smooth leather surface. Sure, it's possible for your cat to poke holes in your leather sofa if he uses it as a scratching post, but general scratches just enhance the weathered look and feel of your living room's centerpiece. Most leather couches can be easily cleaned with sudsy water, but for serious stains, call a professional. Microfiber, a synthetic fabric, provides another great choice for pet owners. It looks a bit like suede, is simple to clean and maintain, and wears well. Microfiber is also more affordable than leather and can be found in many colors to suit most decor tastes. With no loops in the fabric, microfiber is virtually resistant to claw marks, as claws do not catch on the weave. And hair goes practically unnoticed, which is great if your pet is a long-haired breed. Stains are easy to clean off microfiber couches—just blot the accident with a clean towel and then finish it off with a little soap and water. But check the manufacturer's instructions first. The best thing about microfiber is the texture it displays with a simple brush of the hand. Brush it one way for a lighter hue and then, should a stain happen, a darker tone can be achieved by running your hand over the fabric in the opposite direction. For pet owners, a patterned fabric may be better than a solid color, as hair and stains will become less visible. But it is best to avoid any fabric that is nubby since it's too much fun to scratch. Fragile fabrics—such as silk, wool, or linen—should be avoided altogether or used only where your pet is not allowed. And puppy owners should buy a suitable cotton throw that covers the entire couch (no matter what fabric you choose). Then, pull it off to display the underneath, once your little one has matured.